The Missive Maven: Why not use a return address? I've had enough letters misdirected and returned to me, for reasons valid and ridiculous (twice returned from someone whose name and address were correct, and still lived at that very address - very strange), that I always put a return address on everything. Everything. Yes, even postcards. 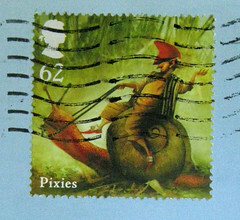 Even Postcrossing postcards. So it totally mystifies me when people don't write return addresses on their envelopes. And yes, in case you're wondering - I DO use an address book, but no one goes into the address book until our exchange is well-established. Sooooooooooooo many people only write 1-5 letters and then go away forever that if I put them all in my beloved Edward Gorey address book, it would be full three times over. So you gotta get over that hurdle for a while before you make it in there. And even then, if you write your return address all nicely on the corner on the envelope, or inside, then I don't even need to open my address book. And thus concludes the rant for the evening. Thanks for hearing (reading?) me out. If you don't use a return address, and you DO want a letter back -- whyever not? Please do comment, I am genuinely curious. I hadn't put return addresses on postcards when I was abroad, which probably wasn't a good idea, but there was so little space that I didn't want to use it up. Now though I've got a document on my computer that I can just print up with nicely typed return addresses and either type it onto labels or paste it onto the postcard and it works out. I'd rather the mail get returned to me than lost forever. Of course I also read once that to be extra-safe with a new correspondent you should also write your return address in your first letter, because envelopes get mangled in the mail. So I've done that, too. okay you will always get a return addy with me . LOL !!! I can assure you on that one LOL !! Zuzu - letter ettiquette, true that. Putting a return address into the letter is new for me, I must admit, but the not adding someone into my address book until a certain amount of letters is a very clear rule. But on a different (but slightly similiar) note I've recently had quite a few requests for my last name. What the hell? I do a lot of corresponding with people through online connections, isn't the fact that you have my first name, and address enough? For the most part I want to believe that people I swap letters with are safe and reliable but this request is annoying to me. I mean if you don't get a letter back to me or if your intial letter was to have been returned I could see you being grumpy and begin asking for my last name. Hmmm, maybe this is just my own grump. I have noticed the surreptitious surname requests especially with LEXers, and it seems to hold true that the creepy ones pester the most. That's a good indicator, for me, to keep them at a safe distance. If it's a genuine grump and not a safety measure, Girlzoot, then I share it with you wholeheartedly! Okay now that you mention it almost every single one that has requested my last name has been a LEXer. This is a service I love, truly I do, and it has brought me some fun fun correspondents, but also some hinky ones as well. It isn't like I hide who I am but some of the fun is the boundaries, the rules that my mailbox is where I let you visit, be it my virtual or my real mailbox. Please do not invade my life. Ah...ranting, do accept my apology. Please, no apology necessary - I'm totally with you. And I like how you articulate how our mailbox is where you let us visit. Well said. One time I did put a return on my postcard and what do you know? They delivered my own postcard to me. Hmm. Just thought you'd ignore the giant address over on the address side and just read the label, did you? But on letters, always a return addy.